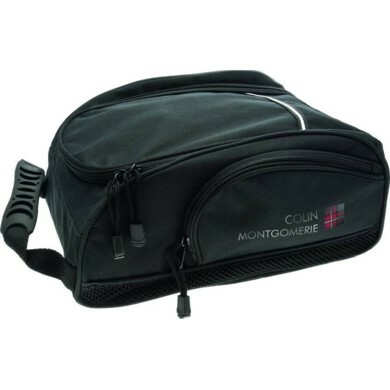 As part of the official Colin Montgomerie golf gift range, the Executive Shoe Bag and Accessories set is the perfect gift for any golfer. The bag features multiple zipped compartments and features breathable mesh strips for ventilation, with a comfortable rubber handle for easy transport. The set includes a shoe cleaning brush with a spike removal tool, a cleaning cloth, black polish, and a dual club brush. The dual club brush features a nylon bristle side for gentle cleaning of your woods, and a brass bristled side for more rigorous cleaning of your clubs. Everything you need to keep your equipment clean and performing at its best.